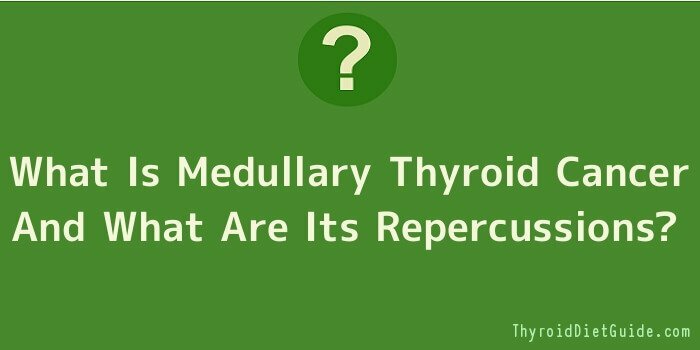 What Is Medullary Thyroid Cancer And What Are Its Repercussions? The thyroid is that gland that is shaped in the form of a butterfly and is located at the throat base. There are two lobes on either side of the thyroid and they produce specific hormones that provide balance to the body. When there is an imbalance in the production of iodine, it results in either hypothyroid or hyperthyroid. The hormones secreted by the thyroid gland are very effective in regularizing the heart rate, blood pressure, temperature of the body and the metabolic activities of the body. So, it is important that the thyroid gland functions effectively so that there is a proper and optimal balance in the organs, muscles and the nervous system. Thyroid glands also are an important factor in the growth and development of kids. What is medullary thyroid cancer? When the thyroid cells increase in alarming numbers and when it is rapid, it is abnormal and it leads to a condition known as medullary thyroid cancer. There are masses forming which is referred to as thyroid tumours. There are different types of tumours and for examination under the microscope; it is observed that there are medullary cancers, papillary cancers, follicular cancers and anaplastic cancers. Anaplastic thyroid cancer is a grave form of cancer and can prove to be fatal. If the condition has been identified in the initial stage, it can be cured. Follicular thyroid cancer originates in the thyroid cells that generate the hormones. As per statistics, it has been observed that there are close to fifty percent cases of follicular thyroid cancer as compared to medullary cancer that comprise of seven percent of the cases. Medullary thyroid cancer begins in the parafollicular cells and calcitonin is produced by these cells. These hormones do not contain iodine or do not produce iodine. The visible symptoms include swelling in the neck and the tumour that presses the windpipe or gullet. However, there is no risk associated with developing cancer even if the tumour is being detected. Identifying the problem is the first step so that the right medication and treatment can be resorted to. Some of the tests in FNA (fine needle aspiration), blood work, biopsy tests and so on. In the FNA method, a fine needle is inserted in the neck and the blood or the sample is removed and sent to a laboratory to identify the severity of the condition. Many of the thyroid tumours are benign, but it is important to rule out any problems whatsoever. If an early diagnosis of thyroid cancer is detected, treatment and medication will help reduce the severity of the medical condition. There are many patients who suffer from this medical condition and it is important that you do not neglect the condition and take the right steps. If you are the unlucky person to attract medullary thyroid cancer, then you can adopt the right medication and treatment and take the right steps to address this medical contingency.